Samsung Galaxy Buds, the wireless Bluetooth earphones, has been certified in the Bluetooth SIG website today. [Updated]: Galaxy Fit e: A few hours ago, we reported about Samsung Galaxy Buds. Now we’ve found another certification from the same BTSIG website for the upcoming fitness tracker from Samsung. The model number certified is SM-R370 and it’s the “Galaxy Fit e” fitness tracker. Online reports suggest that this device would come in 4 color variants namely Black, Silver, White and Yellow. The BTSIG certification clearly shows support for Bluetooth v5.0 and the device described as a “Smart Wearable device”. Other model variants for this Fitness tracker are SM-R370X, SM-R375 and SM-R375X. Check out the certification image below. 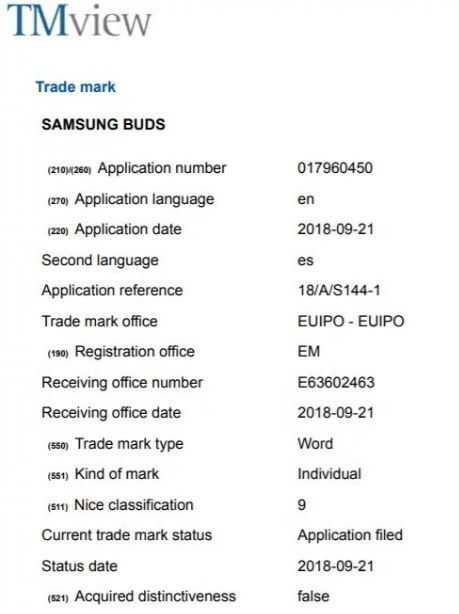 [Original]: Samsung had filed a trademark the term ‘Samsung Buds’ back in September 2018 in the EUIPO office. The trademark was applied under ‘Class 9’ which meant that it had something to do with smartphones. This could be the first Bluetooth enabled earphones with Bixby. We can see the product name mentioned in the BTSIG listing as ‘Galaxy-Buds’ along with the model number SM-R170. The Bluetooth version supported is 5.0 and the description clearly suggests that it is a ‘Smart wearable’ device from Samsung. There is no other info listed in the certificate apart from this. Gear IconX, the fitness tracking earbuds released during the end of 2017, was the first wireless earbuds from Samsung. Samsung could be launching the same Gear IconX again in 2019 under the name of Galaxy Buds or this could be a new device altogether. Based on reports online, the 2019 IconX earbuds are believed to be coming in three color variants namely While, Yellow and Black. It’s also reported to have 8 GB internal storage capacity and it can store twice the number of media files than the old IconX which only had 4 GB of storage capacity. The battery life would be considerably better than the old IconX and there will be touch control for playing around with voice assistant, music and answer phone calls. Given that the device has been certified just a few weeks before the Unpacked event, we can expect it to launch during the same event on February 20, along with the Galaxy S10-lineup.